After loading the magazine, a shooter needs to quickly seat the magazine, chamber a round, complete her grip, and present on target. If your slide is locked back, you can rack the slide OR you can choose to drop the slide closed using the slide stop (often called slide release) by using your strong-hand thumb or support-hand thumb to depress the lever. In this dry-fire video, Tatiana Whitlock demonstrates two different techniques to using the slide stop to chamber a pistol round. 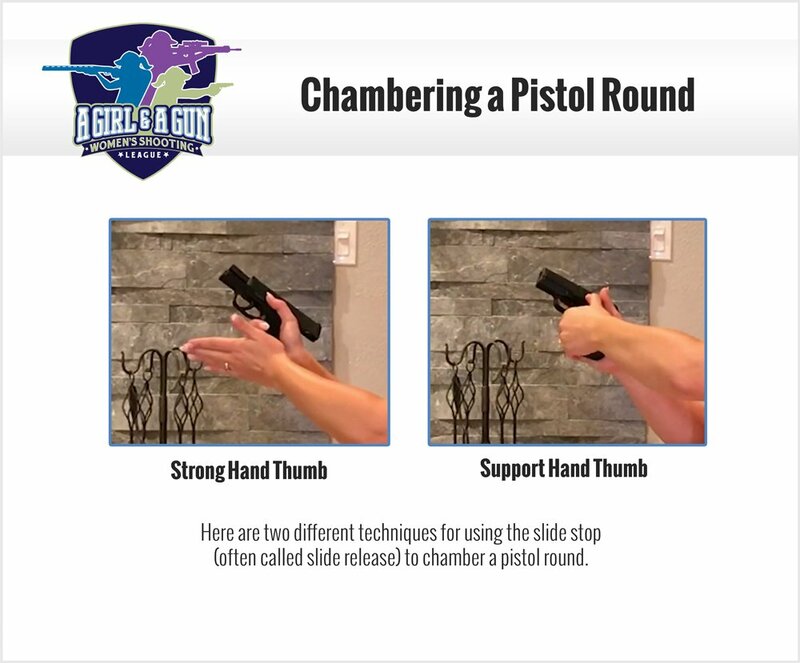 If a shooter has the strength and dexterity in her strong-hand thumb, she can reach up and apply downward pressure to the slide stop, which will send the slide forward and chamber the top round of the magazine. For various reasons, a shooter may need to let her support hand do the work. Leave your palm on the base of the magazine, and use your support-hand thumb to reach up and depress the slide stop lever. Then your hand can roll into a proper grip. These are two viable options for chambering the top round using the slide stop.